Oregon is the world’s major producer of cool-season forage and turf grass seed and a widely recognized center of expertise in seed production. Most of the acreage is located in the Willamette Valley, the “grass seed capital of the world.” Farm gate value of Oregon’s production for the last several years has been historically low. Farm gate sales for 2017 were estimated to be $455,213,000. Collectively, Oregon’s Willamette Valley produces almost two-thirds of the total production of cool-season grasses in the United States (U.S.). 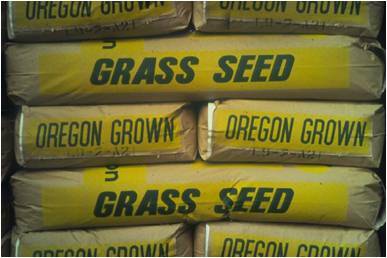 Grass seed is produced on nearly 1,500 grass seed farms in Oregon. Seed production of one or more grass species are the major enterprises, with growers using machine technology especially adapted to small seeds. Mild and moist winters with dry summers favoring seed development and harvest make the Valley an ideal place to produce high quality seed. Over 390 seed conditioning plants located in the Willamette Valley prepare the seed for market once the harvest operation is complete. Prior to World War II, farms in the Willamette Valley were more diversified and smaller than farms today. Grass seed was introduced as early as the 1920s as an alternative crop for the south valley. Ryegrass was especially well adapted to the wet soils and soon became an important crop. Grass seed also established itself as an excellent alternative crop for the highly erodible foothill soils found on the valley’s eastern flank. Since 1940, the industry has made steady growth, with many national and international seed companies located in the Willamette Valley. The Willamette Valley’s mild, wet winters and dry summers have provided an ideal environment for the grass seed industry to expand. Grass seed crops are grown on more than half of the total harvested cropland in the Willamette Valley. In 2017, Oregon growers produced over 600 million pounds of cool-season grass seed crops. Today, seed crops of over 950 varieties from eight grass species are grown on over 400,000 acres statewide. 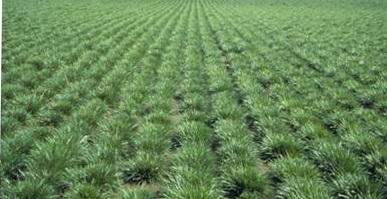 Oregon growers produce essentially all of the U.S. production of annual ryegrass (Lolium multiflorum Lam. ), perennial ryegrass (L. perenne L.), bentgrass (Agrostis spp. ), and fine fescue (Festuca spp.). Smaller amounts, but significant portions of the USA production of Kentucky bluegrass (Poa pratensis L.), orchardgrass (Dactylis glomerata L.), and tall fescue (Festuca arundinacea Schreb.) are also grown in Oregon.